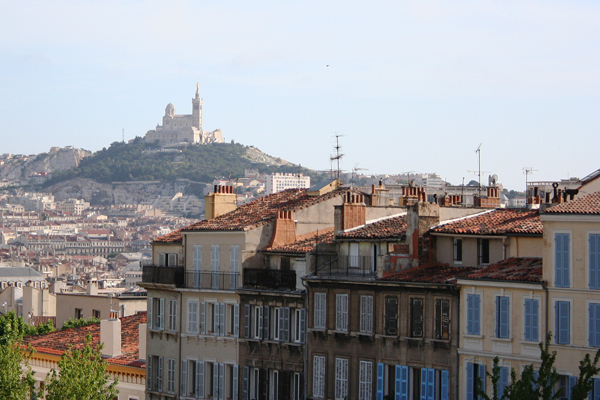 Marseille is France’s second largest city with about 850 000 inhabitants. If you include the suburbs the amount is about 1 500 000. With its strategic location at the Rhône outlet and a natural port, Marseille has been one of Europe’s most important ports since the city was a Greek trading port from about year 600. The harbor is still one of the Mediterranean’s biggest and the most important factor to Marseilles economy. As port cities often have, Marseille has long had a bad reputation – with a lot of crime. After the oil crisis of the 70’s Marseille also struggled with high unemployment. Especially in the suburbs, with a high proportion of immigrants, there have been problems with unemployment among young people. Therefore Marseille has not been an attractive tourist destination. In the last few years however this negative trend has been reversed. Much of the city has been given a real facelift , and there are many exciting areas to experience. Marseille can be a good break from the many touristy towns further east along the Riviera – this is a genuine city for the better or worse. The Old Port (Vieux -Port) is a good starting point for a visit in Marseille. From here the town’s main street La Canebière runs through the city. In the side streets of La Canebière there are perfect places for shopping, especially in the pedestrian Rue Saint – Ferreol and the Centre Bourse shopping center. North of the harbor area is Le Panier, the oldest part of Marseille. Here you can wander through the narrow cobbled streets with small local shops. 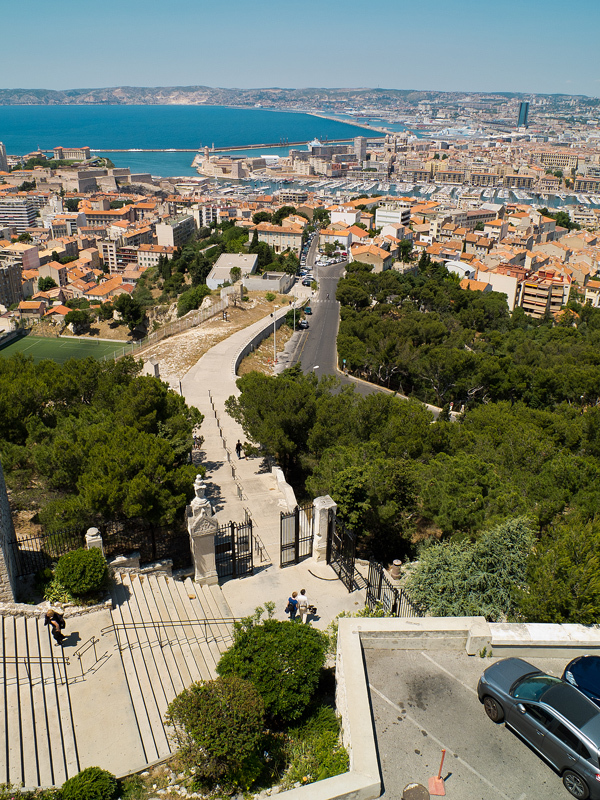 At the highest point of the town, 162 meters above sea level, lays the symbol of Marseille – Church Notre -Dame de la Garde. The church is relatively new – it was completed in year 1864 and has previously been used as a fortress and earlier churches. The view from the top is breathtaking, from here you can see the whole city and the sea. The church is a destination for pilgrims August 15 each year, as they celebrate the Virgin Mary’s Assumption . To get up to the church, you can take bus 60 from the port or the small tourist train. Or you can walk. It’s not far, but a fairly steep hill. On a small island just outside Marseille is the fortress Chateau d’If. The fort was built from year 1524 to year 1531, and already in year 1540 it was used as prison. Alexandre Dumas made the island famous through the book The Count of Monte Cristo. In the book the Count was imprisoned here. Since year 1890 the island has been open to the public and today it is one of the biggest tourist attractions in Marseille. Boats run about every half hour from the port. The boat trip takes about 25 minutes. Along the coast south of the harbor there are a number of beaches. Some sandy beaches and some rocky beaches. The largest and most popular beach is Plages du Prado, about 1 km of fine sandy beaches and all the facilities you need. This is also a popular area for windsurfing, especially in the south. The easiest way to get here is bus 83 which runs from the harbor. But the most exciting way to travel is by ferry from the harbor, look for Batobus. Further south and west towards Cassis is the famous Calanques de Marseille a Cassis. These are small fjords. At the head of the fjords are often small beaches. Many of them are only accessible by boat, but some are able to reach if you’re willing to walk a bit. Since year 1995 there has been invested a huge amount of money in the area north of Le Panier. Old Port stores have been refurbished and are today modern offices, homes and shops. This is an exciting development that goes very fast. There are also several hotels, cafes and restaurants in the area. Easiest way to get here is by the Metro to La Joliette, but it is also not far to walk from the old harbor. The streets behind Quai Rive Neuve (south side of the Old Port) is a nice area with many good restaurants to choose between. La Table du Fort is highly recommended. In the Notre Dame du Mont and Cours Julien there are also many restaurants. Les Pieds dans le Plat is a good option. If you want to try something a little different on the journey there are a large amount of North African restaurants in Marseille. The Moroccan restaurant Le Souk located along the north side of the Old Port has a lot of good food. Marseilles biggest pride is Bouillabaisse. Bouillabaisse is a fish soup/fish stew, served with fish, shellfish and potatoes on the side, as well as bread and rouille (something similar to Aioli) . This is served everywhere in Marseille. If you’d really like to eat a good bouillabaisse, head to Chez Fonfon located in the charming little harbor Vallon des Auffes, a short distance south of downtown. Along the north side of the harbor there are unfortunately some real tourist traps – we would recommend to avoid eating here unless you’ve got a restaurant particularly recommended. Where to stay depends on what you plan to do in Marseille. Are you on a city trip , it is very convenient to stay near the port. Grand Hotel Vieux Port is recommended. If you are going to the beach every day, it might be better to stay nearby. Pullman Marseille Palm Beach is a great hotel right on the beach which is suitable for beach holidays . The easiest way to get to Marseille is to fly direct. The airport is about 3 miles northwest of downtown. From the airport both trains and buses go into the city. There are also direct trains and buses to a number of surrounding cities from the airport, such as Aix en Provence, Arles and Avignon. There are direct trains to Marseille from most major cities in France – for example, it takes only a little over 3 hours by train from Paris, and it costs from 50 Euro.